Also, I got a Malificent (R+) card, is it any worth to level that one up? Moogle Cards (the ones with 3D rendered Moogles) are indeed only used for EXP. They're worth more EXP than a card of an equivalent rarity. You can get whole bundles in exchange for Moogle Points by pressing the button with the orb on the bottom of the screen and going to the last tab. Confusingly, the SR+ level illustrated Moogles are different, and serve a role in the Ultimate Card system. You won't need to worry about that for the minute. Yen Sids "limit cut" a card of equivalent rarity, more-or-less the same as using a duplicate card. So you use an R+ Yen Sid on an R+ card, and you'll be able to level it an additional 5 times, and if you limit cut a card enough, it will become "High Purity" and get a huge stat upgrade. Kazr discusses Limit Cutting and High Purity in this part of the Beginner's Guide. Fairy Godmothers boost a card by whatever number is on the FGM card, for a week. R+ cards boost the card's stats by 1.5x, SR cards by 2x, SR+ cards by 3x. You can't boost a card that's already been boosted, and some cards come pre-boosted fore the duration of an event. R+ Fairy Godmothers are fair for everyday use, though of course you want to make sure it's a card you're going to keep! The Maleficent is okay for what it is, though it's best to work on whatever cards you can find duplicates of, so that you can limit cut them, high purify them, and work from there. You'll find plenty of dupes during the story. If you have duplicates of the Maleficent card, great! I'll have a look through that site as well then. It'll take some time because I have no idea where to look, but even with the ultimate cards in the game, it's still pretty good for beginners I take? Yeah. Don't worry about the card guide unless you're trying to do a comparison. Wait until the moment comes where you wonder "Should I use this Daisy SR in my deck, or the Prince Phillip SR?" And then compare their stats. Or more complicated situations like "Should I use this High Purity R+ card or this SR card I can only limit-cut once?" Yay welcome! You'll get the hang of it in no time. Fairy Godmothers won't be much use till later in the game. The beginning story chapters you'll be able to beat with the cards you are given. What union did you join? I joined the Bear (because the tutorial told me to xD) I'm going fairy decent, getting at a high enough level where AP is getting a problem and I can't simply level up easily to get it all back. At story 2-2 right now, gotta take down Jewelry Bags. I've got a quite good deck now I suppose. Just having problems with the cost limit, which makes me use a low-rank card because I don't have enough points for better stuff. And with 4 YenSids I'll wait a while till I get more of him before I start cutting. Just so you know, the most efficient way to level up is to kill Fat Bandits in Agrabah, if you can handle them in one go. At 10 AP a pop they're a bit of an investment but they do have the best possible return. The good thing about story missions is that the coast to fight any enemy is 1 AP. 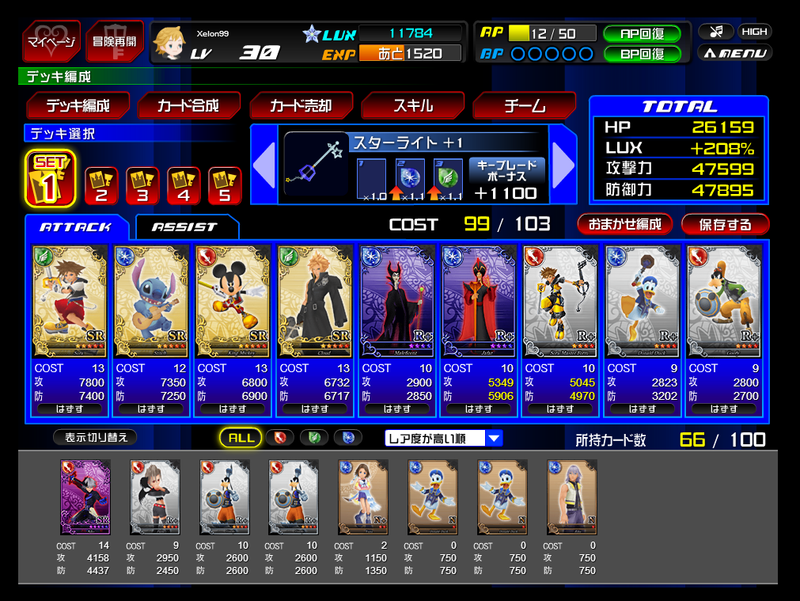 But yeah I remember I had much better cards than I could equipped for a while. I forget what level it is that you need to be to have a high enough deck cost, 60-something? But you will get there eventually. Try to participate in some raid bosses, you'll get some good rewards. You won't be any use damage wise so just do 1 bp hits to contribute to the chain. Well, that is if you have a fairly decent team that can kill a raid boss. I'm still doing the Dwarf Woodlands storyline, at 2-7 now. Does it matter if I'd keep on with this storyline till it's finished or is it wiser to start doing other worlds in between and come back later? I've seen two subspecies Darksides quite rapidly in a row. But they were very low leveled for some reason, because I could nearly beat them. The normal RBs and Subs upgrade separately, so at the start of the day you get a funny little juggling act where the first few subs drop faster than the normal guys! But because players will try harder against the subs, they usually end up harder in the end, it's surprisingly consistent. I can see one major improvement you could do: you can combine those R+ Minnies to create a fully limit-cut Minnie. Level it up to High Purity and it will probably become your single most powerful card. Go splurge a few Moogle Points to get the upgrade. When the game was originally introduced, quests were level-locked, forcing you to alternate in the order Dwarf Woodlands -> Wonderland -> Agrabah (though towards the end, there was a cluster of missions on each world). Thankfully those days are behind us, but if you go visit Wonderland and Agrabah, you'll probably find some real easy missions waiting for you. By the way, maintenance is tonight, 13:00-17:00 JST. The special chests and Pretenders will be replaced with something new, the Darksides will be rotated to another RB and the "weakness Keyblade" will change, and we'll probably get a new Wonderland story update. If you opened an empty Blue chest, you might get some pretty good stuff, like high-level Skills mostly. The blue skills - Combo Plus, Second Chance and Reflect Guard especially - are very handy. But a gamble's a gamble, and these 40 AP chests are really intended for players with 180 AP and lots of Potions, so I'm not sure I'd recommend it unless you just want to give it a shot for fun before the event ends. Here's the full list, you can run it through Google Translate or Google Chrome's in-line translator to see the machine translation. Let's keep this discussion in topic and shift the other discussions off to the main thread. If TC still have other card related questions, feel free to ask. Anyway I will suggest to be a little more patient with the cards. The game gives us SR+ card occasionally, and the card medal roster renews in 3 weeks which you should fully utilize to form your deck. So I just (finally) finished upgrading my Minnie Card. Took a long while till I got enough Moogles surprisingly, but it's an Ultimate now. Now I suppose there's no way to upgrade the R+ to SR or such? 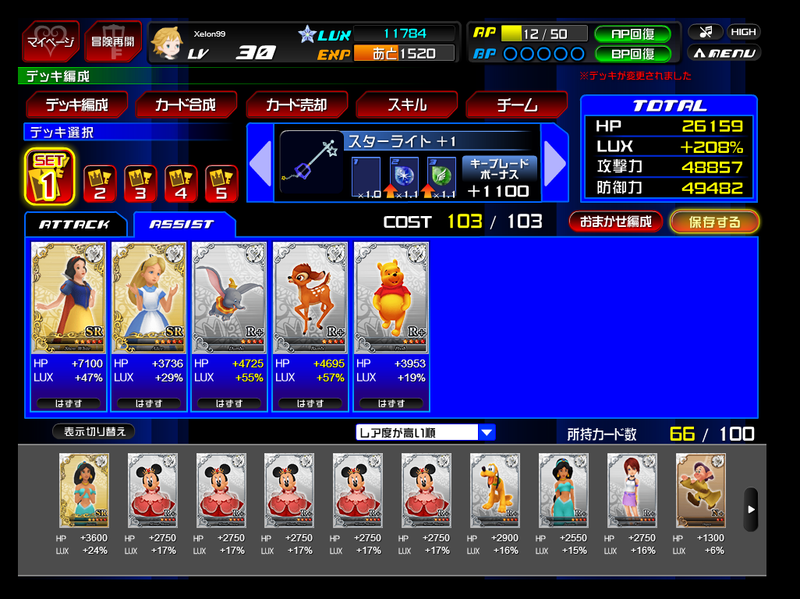 Because I'm starting to get more SR cards now, which eventually will lead to the Minnie card being outnumbered. I also have 11 SR Yen Sids, which I suppose should be put to use... or is there a good reason for me to save them up and use later? And if I do use them, would it be wiser to use them on attack or assist cards? Nah, only SR+s can become Ultimate. See the Ultimate Card guide for more. I recommend saving your Yen Sids to upgrade cards that have been partially limit cut by duplicates, but for which you can no longer get duplicates - say, because the event has ended, or because you got the card from Raise Draw and you're out of Raise Tickets. Generally, the Story will give you enough duplicates to HP the card, as will events if you're willing and able to go far enough, but there are a few exceptions. As a new player, I always recommend you level up your Assists before your Attack cards. Levelling your Assists will get you weekly Lux prizes without even trying, and will always be there to help you in combat, whereas levelled Attack cards only show up when they're drawn, and you might even choose to set them aside as the Weakness Keyblade changes. Okay that makes sense. Only reason why I mentioned it is because I nearly reached my limit earlier on cards, and with all the Yen Sids I thought it would be best to just check. I did get a few SR+ Cards from the Raise Ticket so I might HP those eventually, I'll check their rarity in a bit. I also have a few cards where the Lux and HP are in yellow instead of white text. I assume this is a bonus, but from what? I can't find info on that in the guides. In that case: any card can be HP, even Ns, though it's a waste of time to do it for anything lower than an R+. That's partially to do with the power of the weaker cards (it doesn't take long to get up to the R+ level), but besides that, HP'd R+ and SR cards can eventually be sold to earn Card Medals, which you can learn about in some of the guides. Yellow numbers indicate the card is boosted. Assuming you didn't boost it yourself with a Fairy Godmother, the boost will expire after a certain maintenance. There are no real hard or fast rules to how long a set boost will last, you can usually find the info in one of the posts attached to the original event. Since there isn't a maintenance this week for some reason, it'll last for at least a week longer. As Kazr said a few posts up, it's probably best to address these sorts of general questions to the Walkthrough thread, it's how this subforum is organized.